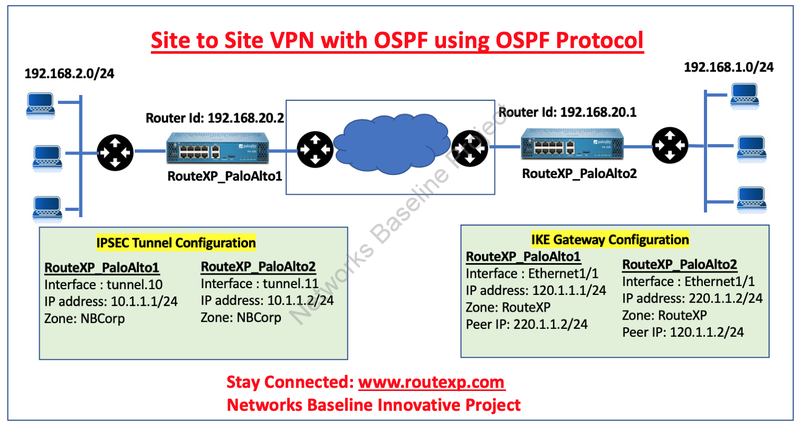 Today I am going to talk about the basic configuration of Site to Site VPN with OSPF onto the Palo Alto Next Generation Firewall. Taking an example of 2 sites where we are going to use OSPF as a dynamic routing protocol for traffic to flow between the sites. Here in the example, the tunnel IP address on each VPN peer is manually allocated and assists as the next hop for routing data among the sites. For the basic configuration, first we need to configure the L3 interfaces on the firewalls on both sites. Select Network>Interfaces>Ethernetand then select the interface you want to configure for VPN. Now Select Layer3from the InterfaceType drop-down.On the Config tab, select the Security Zone to which the interface belongs.The interface must be available from a zone outside of your trust network. Think making a committed VPN zone for visibility and control over your VPN traffic.if we have not yet created the zone, select New Zone from the Security Zone drop-down, describe a Name for the new zone and then click OK.Select the Virtual Router to use. To allocate an IP address to the interface, select the IPv4 tab, click Add in the IP section, and input the IP address and network mask to allocate to the interface. To save the interface configuration, click OK. Create a tunnel interface and assign it to a virtual router and security zone. Select Network>Interfaces>Tunnel and click Add.In the Interface Name field, indicate a numeric suffix.On the Config tab, magnify the Security Zone drop-down to describe the zone. Select the Virtual Router. Allocate an IP address to the tunnel interface, select the IPv4 or IPv6 tab, click Add in the IP section, and enter the IP address and network mask/prefix to allocate to the interface. This IP address will be used as the next hop IP address to route data to the tunnel and can also be used to monitor the status of the tunnel. Set up the Crypto profiles (IKE Crypto profile for phase 1 and IPSec Crypto profile for phase Select Network> Network Profiles> IKE Crypto. Select Network> Network Profiles> IPSec Crypto. 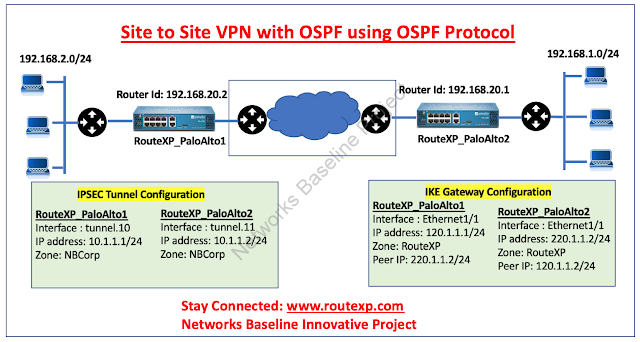 Set up the OSPF configuration on the virtual router and attach the OSPF areas with the appropriate interfaces on the firewall. Select Network> Virtual Routers and select the default router or add a new router.Select OSPF (for IPv4) or OSPFv3 (for IPv6) and select Enable. Preshared keys: enter same value as on RouteXP_PaloAlto1. Set up the IPSec Tunnel. Select Network> IPSec Tunnels. Click Add and configure the options in the General tab.Select Show Advanced Options, select Tunnel Monitor, and specify a Destination IP address to ping for verifying connectivity. IKE Gateway: Select the IKE Gateway defined above. IPSec Crypto Profile: Select the IKE Gateway defined above.